Rohit Agarwal shares with us another of his favorite Indian gems, this time cruising down the relaxing and stunningly beautiful Kerala Backwaters, in Southern India. The word Kerala translates to “The Land of Coconuts” in Malayalam but the natural beauty and the mesmerising rivers combined with the spices, it is best known as “God’s Own Country”. Kerala is situated deep down in Southern India and is encircled by Lakshadweep Sea on its western side. In this article, however, we shall be concentrating on the back waters of Kerala. If you are new to this term and even plan on visiting this gorgeous state in the near future, this might just be the best article for you. Kerala backwaters are an extensive network of rivers, lakes, water bodies and their inlets. These form a waterway of nearly 900km. This area is actually the cover for more than the entire state of Kerala. They also include canals which are both man-made and natural. The houseboats, better known as “kettuvallams”, are a major place for tourist attraction in Kerala. Every year there is a surge of tourist bookings for a stay at a super luxurious houseboat. These houseboats are well equipped with all modern necessities including air-conditioning, geysers and inverters. There are well-maintained arrangements for “corporate meetings and business” too. In case, you are planning a meeting and also want a cool and serene location, the Kerala backwaters might be the best option for you. Arrangements are made available to parties for formal purposes where in you can conduct your appointments. Now, you can be on vacation while working. What else do we want? The ferry services that allow smooth travel from one part of the lake to another lead to exotic resorts. These resorts are made available for tourists all year round and you can enjoy the simple pleasures of life. Snake Boat races are the most attractive event of the Kerala Backwaters. Thin boats where more than 100 men can be accommodated are engaged in racing all along. This is the major form of entertainment and thousands of people and tourists gather around the lakes to view this auspicious event. The Paravur Lake and Paravur Estuaries add to the beauty of backwaters in Kerala. The Paravur is guarded by water on three sides and tourists often go boating around it. The white sand and the greenery make it even more attractive. You can also opt for fishing while you are here. Munroe island is a part of the Kerala backwaters and it is famous for its bird watching spots. If you are lucky, you can spot a variety of them including woodpeckers, kingfishers, paddy birds and egrets. If you are in Munroe Island, make sure to have a close look at the spice trees too. Another alluring backwater place is Kasargod. This place is famous for rice cultivation and processing and also coir processing. Coir processing and weaving is very common in Keralite villages. The mesmerising landscape of this destination makes it worth your visit. It also houses the famous Chandigiri Fort. If you are the adventurous kind, you shall not be disappointed too. The Kerala backwaters have something to suit all tastes. Water sports, water boat riding, cruising is part of the trip to Kozhikode. Spend a lovely and relaxed afternoon with your family and friends here. Movie and cinema locations are also a major reason for the Kerala backwaters to be so popular amongst travellers. Several Tamil and Telegu films have been shot here. Bollywood films including “Tashan” were shot here and many others including “Ekk Dewana Tha” and “Alone”. 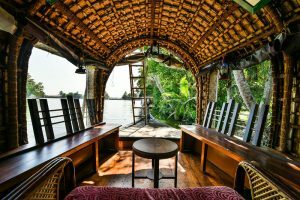 We have stated just stated 10 reasons why you must visit Kerala backwaters but believe us when we say that there are many more. So, pack your bags and let your inner traveller explore. Ed Prutschi is a criminal defence lawyer in Toronto, Canada practicing at the law firm of Adler Bytensky Prutschi. When not completely absorbed by the rigours of his trial practice, Ed revels in grabbing his camera ..
Get all the latest updates on my Twitter Page!